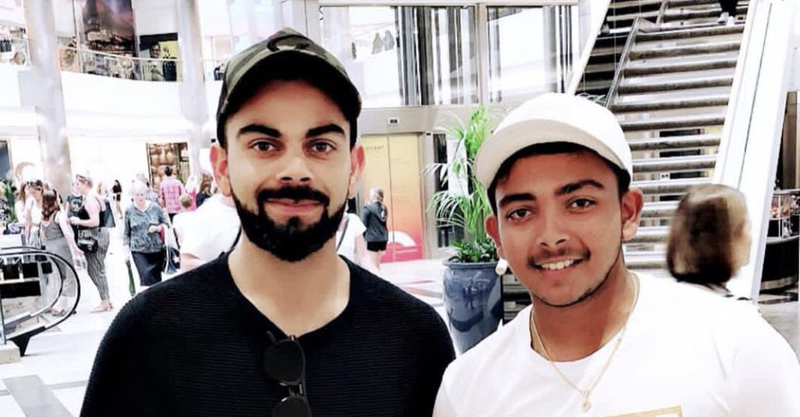 It seems that Indian skipper Virat Kohli is super confident and protective for Prithvi Shaw. Stop the comparisons and let Prithvi Shaw be — Indian captain Virat Kohli demanded: “some space” for the teenage sensation, whose batting has drawn parallels with the likes of Sachin Tendulkar and Virender Sehwag. Hailed as a child prodigy, Shaw had a cracking Test debut against the West Indies team, hitting 134 off 154 balls in the first Test against Rajkot. The knock led to a media frenzy and a series of comments on how he is destined for greatness. On the eve of the second Test, the skipper, who tasted stardom quite early himself, took queries on the 18-year-old and called for some space. “I don’t think he should be rushed into anything yet because you need to give a youngster a space to grow, in his own abilities. This guy is supremely talented and he has got great ability as everyone saw,” the skipper said at the pre-match press conference. Tournaments like the IPL, the A tours, live coverage of the U-19 tournaments put youngsters under instant spotlight and Kohli agreed that they are more equipped to handle pressure situations. “Definitely it could be one of the reasons (early exposure) because they are already exposed to the environment that the international game would replicate. But there’s always pressure of playing for the country. IPL is one of the tournaments that had helped youngsters not get overawed by top flight cricket. “So I agree with the fact that they have played in situations in the IPL where they play in front of so many people that they are not nervous anymore at the big stage. The skipper scored his 24th hundred in Rajkot where he ran nearly 100 runs (99) in singles and doubles. The master batsman believes that he has now reached a stage where he can bat for two days piling up runs in singles and doubles. “You also have to realise that by the time the middle-order walked in at that game, the ball was soft. The pitch was not as quick, the harder ball comes onto the bat, so you have more boundary opportunities. However this strategy comes with a rider according to Kohli – clarity of mind. “You don’t necessarily need to hit a boundary and if you are convinced about that in your own head then the bowler gets to know as well and then the battle of patience starts. “So I think you have to be convinced first that you can play all day with singles and doubles and not necessarily wanting to hit the big shots but given an opportunity, obviously you’ll cash in on the loose balls. I think defence and understanding your off stump and being happy with that set up is the most basic in Test match batting,” the skipper added.